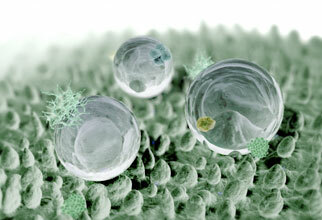 Nano is used in textiles mainly to provide stain-resistance or anti-bacterial properties. Some clothes made from these textiles can now be purchased in high-street shops, usually with these properties described on the tags attached, though they may not mention the words nano or nanotechnologies. What is the 'Lotus Effect'? 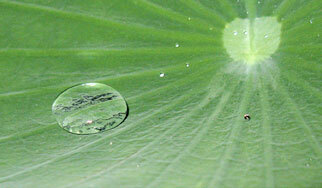 The leaves of a lotus plant actually repel water and other liquids, even glues. They are structured so that when it rains, little beads of water form on the plant’s leaves and instead of spreading out, they just roll off. The plant does this using its own nanotechnology. Basically, nano-sized hairs combine with the wax coating of the leaf to make the water droplets sit up on the surface without dispersing onto the leaf’s surface below. This doesn’t just happen with lotus leaves. A similar process works for some insects, the wings of butterflies and the proverbial ‘water off a duck’s back’. Whenever a textile, or other product like glass or paint, repels water in this way, it is referred to as the Lotus Effect. Nano coatings (such as Teflon-like substances) are created and bond with the textile, so that little nano-sized molecular hooks attach to the fabric of the garment and the hair-like structures repel the water like the lotus leaf. But because these are nano-sized they don’t make the fabric stiff, so keeping the softness of whatever is coated.